In August 2016, Parks Canada employees noted a few brook trout (Salvelinus fontinalis) with suspicious swimming behaviour at Johnson Lake in Banff National Park. A subset of fish from this lake were sampled for health assessments. Fresh frozen and formalized whole fish were submitted for diagnostic evaluation to the Animal Health Centre, British Columbia’s Ministry of Agriculture provincial veterinary diagnostic laboratory, also home to the BC node of the CWHC. Here the fish were diagnosed with the first known Canadian case of whirling disease. 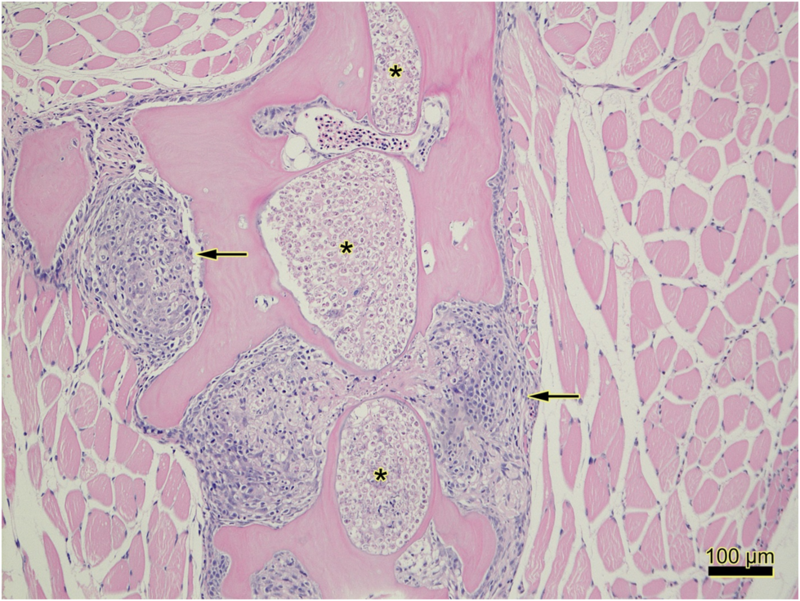 Histopathological evaluation of these fish revealed large numbers of characteristic myxosporean trophozoites widely infecting cartilage and bone throughout the head, gill arches and vertebral bodies – a pattern that in freshwater salmonid fish is pathognomonic for whirling disease (see photos below). The submitted fresh frozen fish tested positive for Myxobolus cerebralis through nested PCR testing (Andree et al. 1998) and was also further confirmed through DNA sequencing. As whirling disease is a federally reportable disease under the Health of Animals Act this was reported to the Canadian Food Inspection Agency (CFIA). The CFIA subsequently confirmed the detection of whirling disease. Additional surveillance of fish in watersheds inside and outside of the Park is currently underway to determine whether the disease is present in other areas. 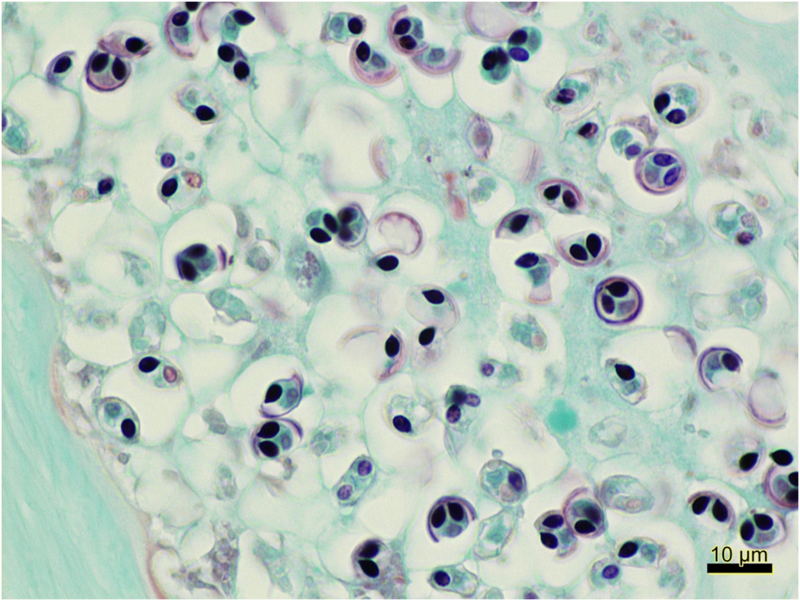 Whirling disease is an infectious disease, caused by the myxosporean parasite Myxobolus cerebralis. 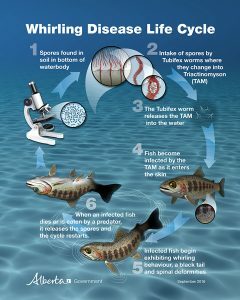 It is primarily a salmonid (salmon and trout) disease and is characterized by erratic circular swimming movements (hence the common name for this disease). The parasite primarily infects the cartilaginous- and boney tissues of the head, vertebral column, and fins. The characteristic ‘whirling’ swimming pattern is due to constriction of the spinal cord, brain, and brainstem. Vertebral malformation is also associated with constriction of the spinal nerves that normally regulate skin pigmentation and infected fish also often exhibit skin darkening of the tail and tail fin. To complete its lifecycle it requires a freshwater oligochaete worm (Tubifex tubifex) as intermediate host. This worm is widely distributed within fresh water bodies throughout the world. Host response to M. cerebralis infection varies greatly among the different genera and species with some considered extremely sensitive (e.g. 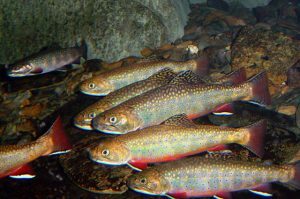 rainbow trout Oncorhynchus mykiss; cutthroat trout Oncorhynchus clarkii), sensitive (e.g. brook trout Salvelinus fontinalis; bull trout S. confluentus), partial resistance (e.g. brown trout Salmo trutta), or strong resistance (e.g. lake trout Salvelinus namaycush, Arctic grayling Thymallus arcticus). Young fish are also more susceptible to infection than older fish and mortality rates in young fingerlings are often > 90%. In older fish the behavioural abnormalities often result in increased predation. Whirling disease related restrictions and control in Banff National Park can be found on the Parks Canada web site. 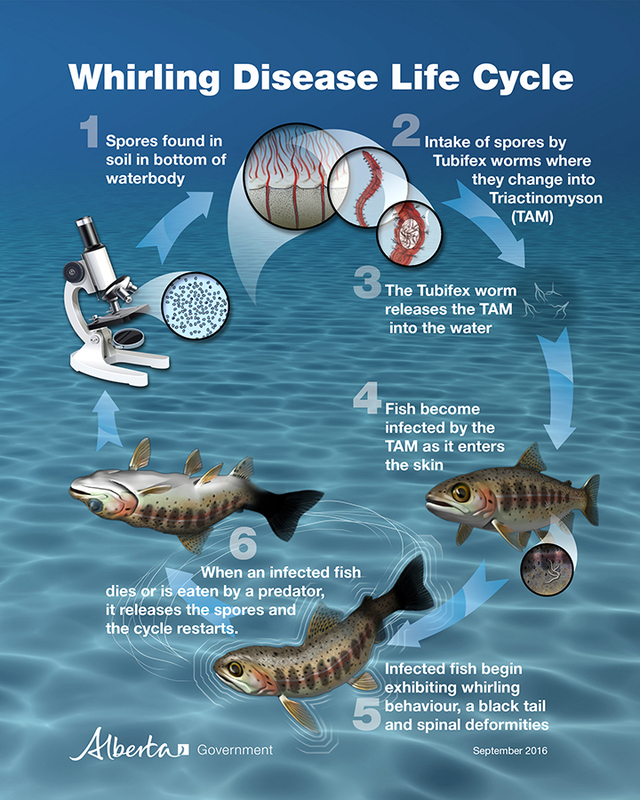 For more information on whirling disease please visit the Canadian Food Inspection Agency Whirling Disease Fact Sheet and the Montana Water Center Whirling Disease Initiative. 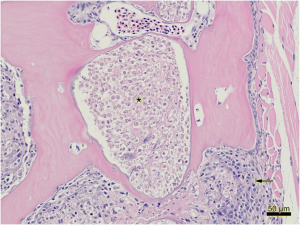 Figure 1: Pockets of myxosporean trophozoites (Myxobolus cerebralis) within bone (astericks) and foci of granulomatous inflammation (arrows). 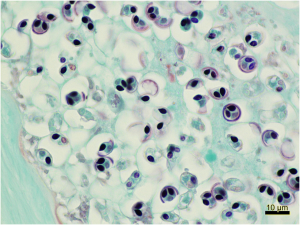 Figure 2: Higher magnification view of Figure 1. 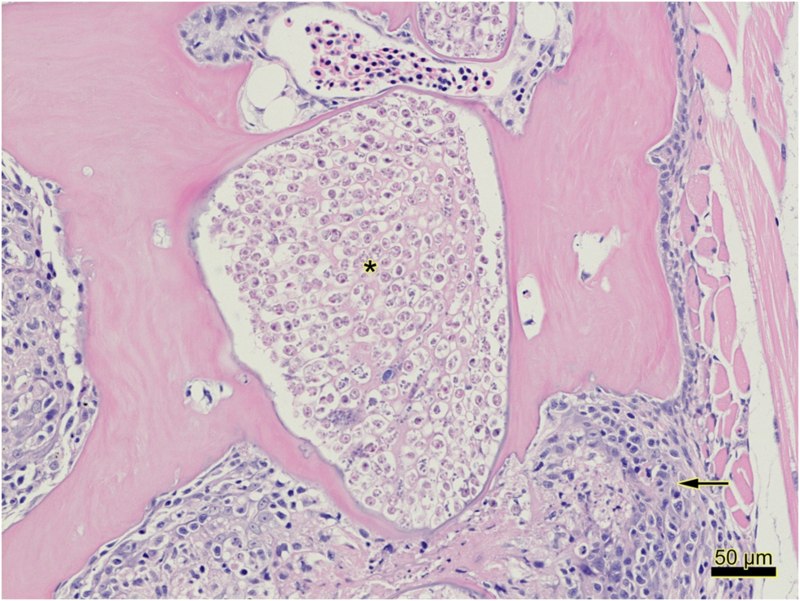 Pockets of myxosporean trophozoites (Myxobolus cerebralis) within bone (astericks) and foci of granulomatous inflammation (arrows). Mind Controlling Parasite in Alberta!